A strong didactic program is critical to the training experience. Our residents have protected didactic time (1 half day/week in the PGY–I year and 1 full day/week in the remaining years) that integrates a balanced curriculum with developmental learning based on the PGY level. PRITE and board–relevant teaching with specific courses on test prep are included. Residents are exposed to psychotherapy and subspecialty topics in the PGY–I year; the subsequent years of training build upon this foundation. All members of the academic staff, including several volunteer faculty members and the chair of our department, Dr. Petros Levounis, are extensively involved in teaching. PGY–I resident didactics provide a primer for psychiatric interviewing and history taking. Residents should expect to learn the basics with regard to the diagnosis, treatment, and management of inpatient and emergency issues. Residents are also introduced to the basic concepts of psychotherapy. PGY–II year resident didactics provide a more comprehensive review of the major psychopathology with regard to diagnosis, treatment, and management. Residents should expect to learn more about sub–specialty topics like consultation liaison psychiatry and begin to gain exposure to psychotherapeutic modalities like supportive therapy. PGY–III year and IV residents’ didactics provide a more in–depth academic exposure. Residents learn how to apply advanced psychotherapeutic techniques to individual therapy patient cases. There are seminars on CBT, interpersonal therapy and psychodynamic therapy. Residents are also exposed to sub–specialty topics and evidence based mental health with a focus on using and evaluating literature. 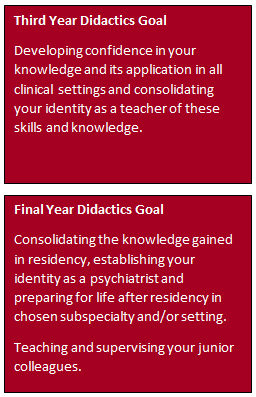 Residents should expect the didactics in this year to also focus on board–relevant information, skills to bridge to future psychiatric practice, and develop skills in teaching juniors.